Nearly every year, Chinese New Year and Valentine's Day falls on very close dates with this year being only one day apart. Hence there are a few places that serve both Chinese New Year and Valentine's Day menu. 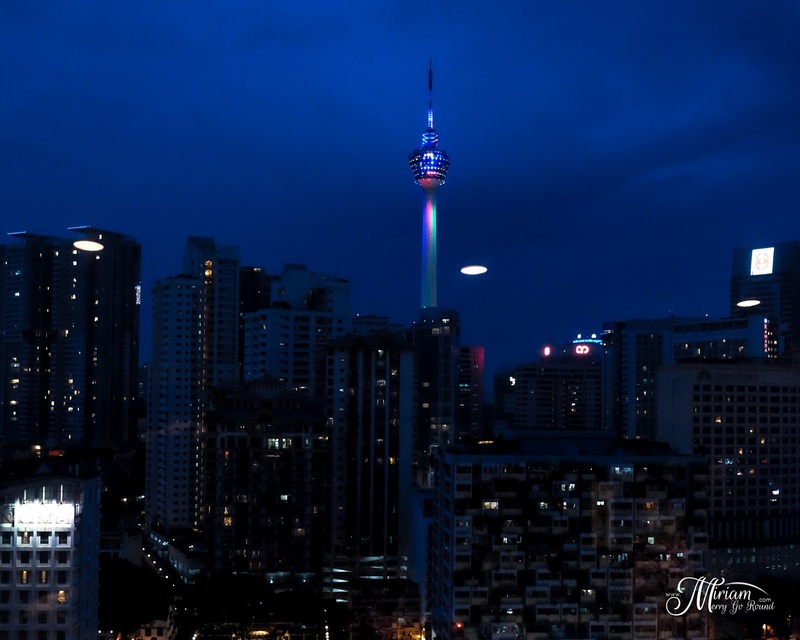 This includes Bintang Revolving Restaurant at The Federal Hotel Kuala Lumpur. 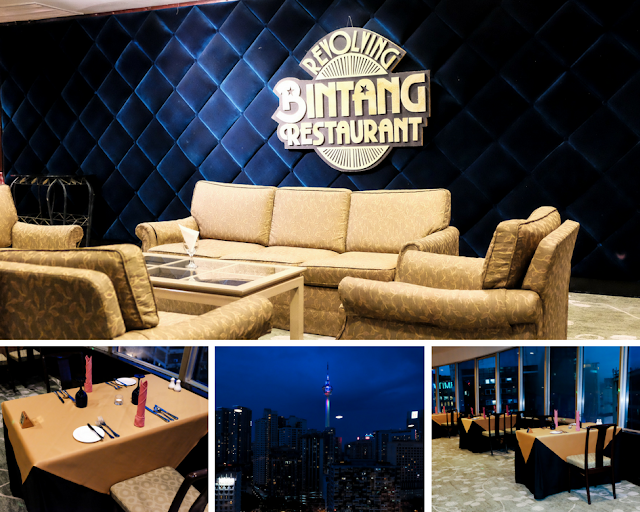 If you did not know, Bintang Revolving Restaurant is the first revolving restaurant in Malaysia, located on the 18th floor of The Federal Kuala Lumpur. This is my first time actually dining in a revolving restaurant so I was excited and looked forward to the meal. 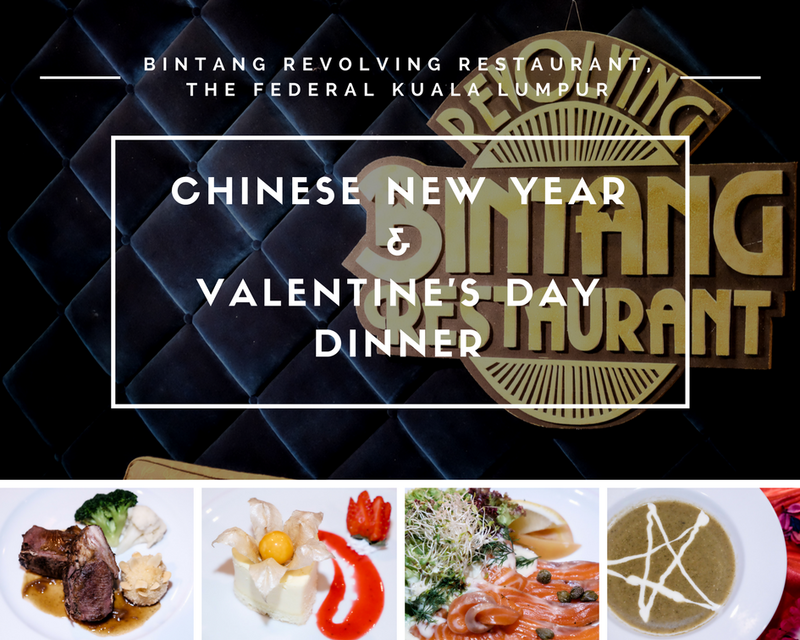 This year, enjoy the Double Happiness 5-course Set Dinner or the Valentine's Day 5-course Set Dinner with the gorgeous view of the KL City skyline, the KL tower and KLCC. 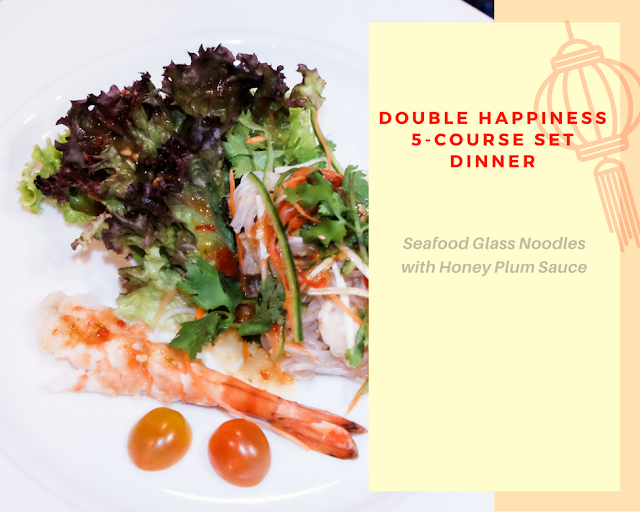 The Double Happiness set menu will be available from January to February while the Valentine's Set Menu is only available on 14 February 2018. 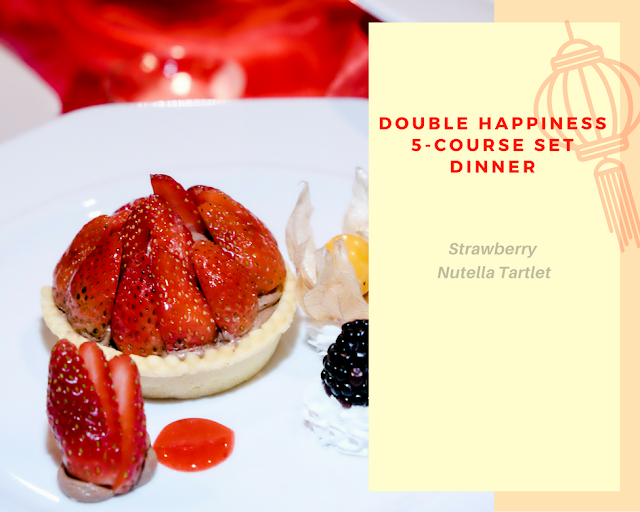 Priced at RM138nett per person, Double Happiness 5-course Set Dinner is exclusively designed by the team of chefs at Bintang Revolving Restaurant. The dinner starts off with Seafood Glass Noodles with Honey Plum Sauce as the appetizer. Sweet, tangy and with a nice kick of heat, this dish awakens your appetite with a fiery start. 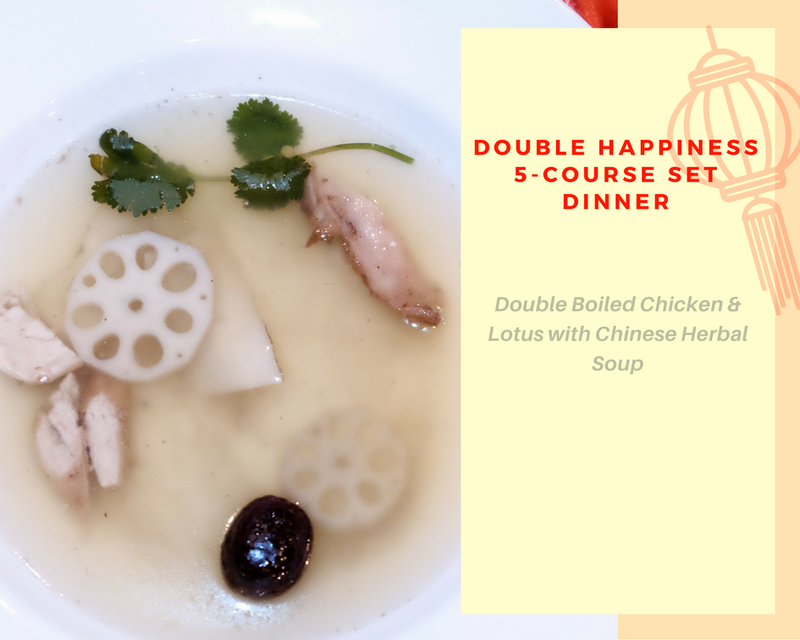 Cool down your taste buds with the Double Boiled Chicken & Lotus with Chinese Herbal Soup which was well seasoned and sweet from the chicken essence. Light on the palate, this calmed the senses preparing you for the next dish. For the mains, you have a choice of the Oven Baked Rack of Lamb with Garlic Brown Sauce or the Grilled Salmon with Honey Light Sauce. Both are surprising choices for a Chinese New Year Dinner Menu as we are normally accustomed to Asian dishes during this festive season. However, I must give praises to the lamb which was well seasoned and baked well leaving it tender and flavorful. Pairing it is a side of fresh salad and potatoes which I loved especially the potatoes. If you prefer fish, try their Grilled Salmon with Honey Light Sauce. The piece of grilled salmon was a generous portion and well grilled leaving the insides pink. Also paired with salad and potatoes on the side. Ending the dinner Nutella Tartlet with Strawberry for dessert. The Nutella tart was rich and creamy with the Strawberry slices giving it a fresh burst of flavor. 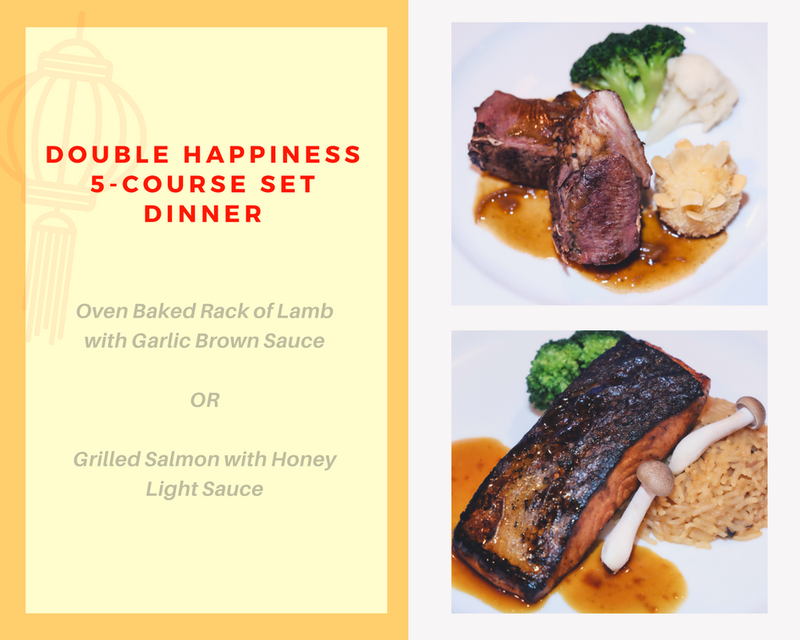 As a whole, the Double Happiness 5-course Dinner Set can be a good replacement for Valentine's Day dinner too. 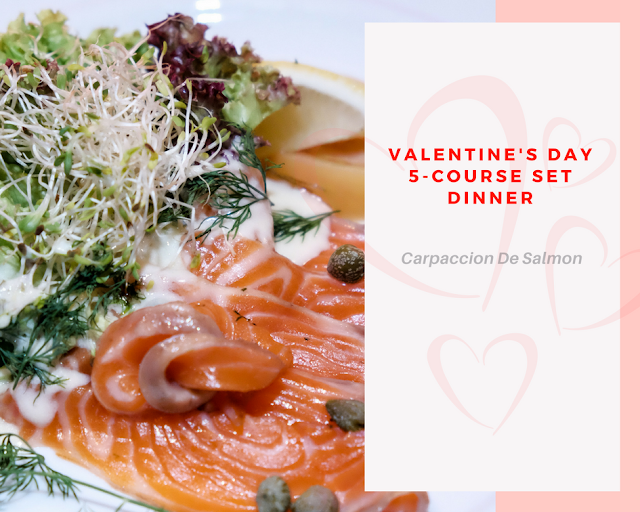 Next up the Valentine's Day 5-course Set Dinner starts off with Carpaccion De Salmon. Fresh marinated salmon slices served with green salad and dill yogurt dressing. It reminds me of the one I love from IKEA. The salmon slices were fresh and a pleasure to enjoy when served chilled. 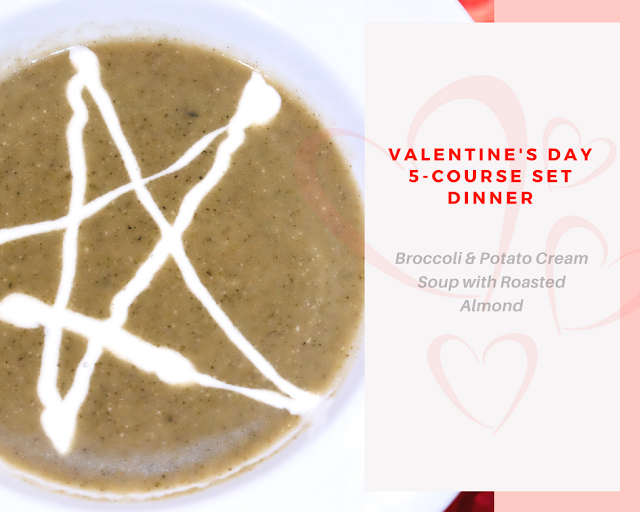 We were then served with Broccoli & Potato Cream Soup with Roasted Almond. The soup was very creamy and well presented making it a hearty selection. 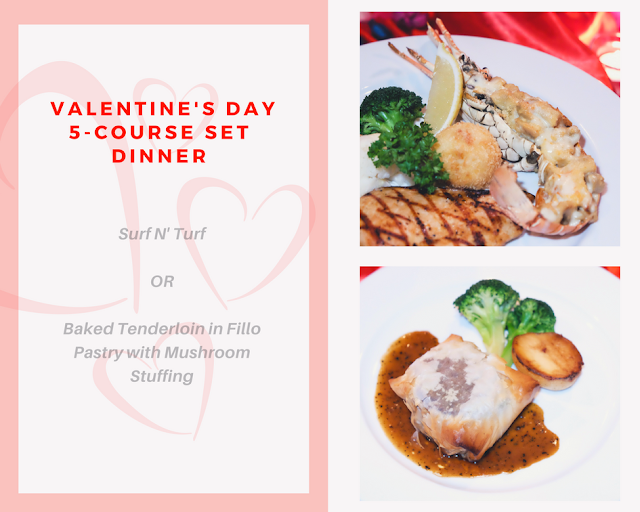 For the mains, you have a choice between Surf & Turf or Baked Tenderloin in Fillo Pastry with Mushroom Stuffing. The Surf & Turf is a good option if you can't decide between seafood or chicken. You get a portion of stuffed lobster with wild mushroom and grilled chicken breast with wild mushroom sauce. I personally am more of a meat lover so the Baked Tenderloin in Filo Pastry with Mushroom Stuffing was the preferred choice. Underneath the crispy layer of filo pastry, you get a good chunk of tenderloin baked well. A generous portion for the meat lover. 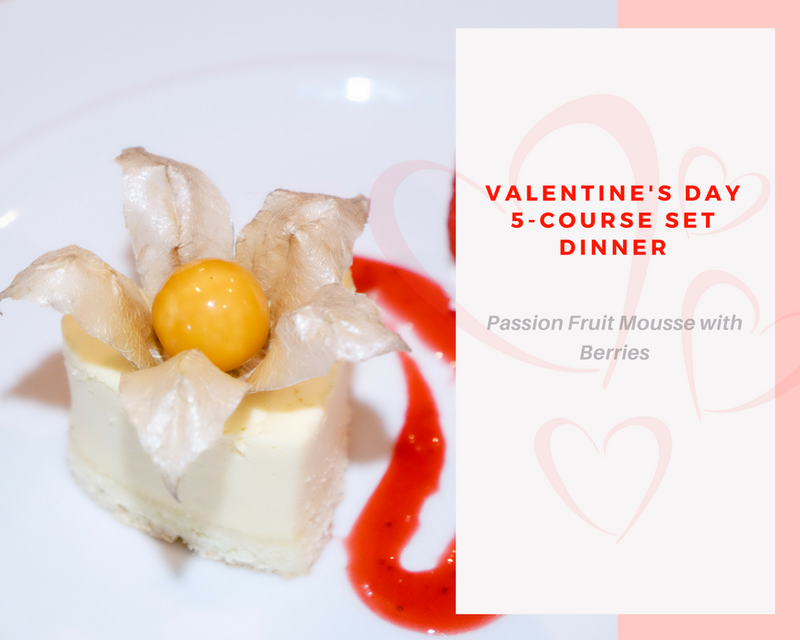 End your sweet date with the Passion Fruit Mousse with Berries. The passion fruit mousse was light and creamy tho slightly a bit too tangy for my liking. Somehow the Nutella Tart suited the Valentine theme more but it sure gave you a different ending than any regular Valentine's Day Dinner. The 5-course Valentine's Set Dinner is priced at RM288 per couple and only available on 14th February 2018. Accompanied by the gorgeous view of the city skyline, this would be an interesting place to bring your date. Valentine's Day is drawing near so hurry make your reservations at 03-21489166 or at www.fhihotels.com for more information.